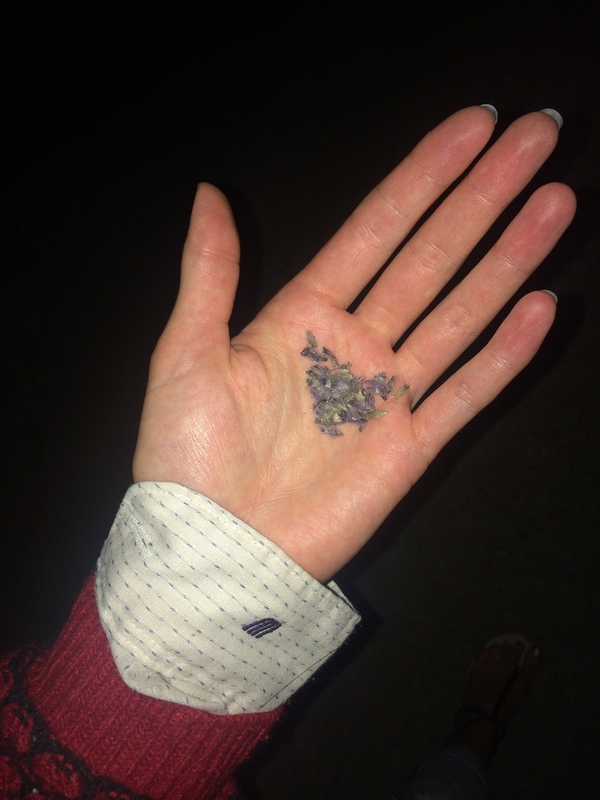 This is a great piece on the basics of brain chemistry and herbs, from herbalist Gail Faith Edwards. The subject is as you likely know by now, dear to my heart and close to home. I've written more than several times about various neurotransmitters' effects on our daily lives - from fat and fasting to push dopamine production - to early highlights of science's bettering understanding of mental disorders stemming from our stomachs. If you're as into this as me, you'll be happiest in the Mind section of Erthly. And otherwise knowing that it's a conversation we'll continue to follow closely. Love, joy and happiness are primary issues of life. It is what we all want. But depression and sadness are just as fundamental to the human experience as the more positive states of mind. What influences how we feel? Our genetic make-up has a lot to do with it, so does our past personal history, environmental factors, lifestyle, food choices and thought processes. All these factors affect our brain chemistry. Feelings of hopelessness and negativity, inability to focus, compulsive thought processes and behaviors, are all symptoms of altered brain chemistry. Antidepressant and mood altering medications do not change negative behaviors or feelings, the effect they have on our brain chemistry is what changes them. This means that changing our brain chemistry is what changes our feelings and behaviors. The assumption that we need medications to do this is faulty thinking. The best way to change brain chemistry is the safest, healthiest and the longest acting method – using natural whole foods and herbs. The key to using herbs and foods to nourish healthy brain chemistry lies in knowing which specific brain chemicals need to be enhanced or reduced, and what herbs and foods, activities and attitudes will do that. The mediators of mood are neurotransmitters. When neurotransmitters become unbalanced it causes a variety of psychological conditions, including sadness, compulsive thoughts, inability to concentrate, mood swings and depression. Neurotransmitters – are hormone-like chemicals that work on the central nervous system and affect not only the brain, but the entire body. Neurotransmitters are messenger chemicals that create feelings, stimulate thoughts and trigger memories. 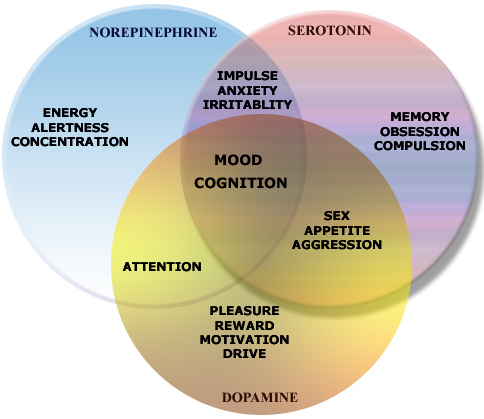 There are three important neurotransmitters to know about. Serotonin – norepinephrine – dopamine. Serotonin – Key words are well being and peacefulness. Serotonin boosts feelings of optimism, self esteem, relaxation, and security. Adequate levels ensure good concentration and deep sleep. The more serotonin you have, the less pain. Dopamine - and its derivative, norepinephrine - are considered a single chemical. This is the energizing, “gas petal” chemical that promotes increased feelings of alertness, wakefulness, assertiveness and aggressiveness. This chemical heightens energy, speeds up thoughts and improves muscle coordination. Too much norepinephrine causes anxiety and aggression, stimulates violent behaviors, and causes schizophrenia, paranoia and psychosis. One of the most powerful and fastest ways to alter these neurotransmitters is by your herb and food choices. Dopamine Foods rich in protein boost dopamine and norepinephrine within minutes, causing increased alertness, speeding up thoughts, and increasing assertiveness. A three ounce serving of fish, red meat, chicken, turkey or eggs boosts dopamine/norepinephrine in less than 30 minutes. Beans and legumes, fermented soy like tempeh and miso, and beverages like coffee (found to speed up transmitters, speed thoughts, improve reaction time and mental functioning and enhance mood after a 20 year study. ), black tea, green tea and milk all boost dopamine and norepinephrine. Seeds and nuts such as sunflower, pumpkin and milk thistle also boost dopamine and norepinephrine levels. Herbs that raise dopamine levels include ginseng, nettles, red clover, fenugreek, dandelion and peppermint. Activities that enhance these “gas pedal” neurotransmitters include listening to rock & roll music, the louder the better, any rush of activity, tennis or any action sport like rock climbing, and attending a fair or exciting show. Serotonin Foods rich in complex carbohydrates such as whole grains, including rice, oats, corn, millet and buckwheat help sustain and boost serotonin levels, and thus a sense of well being and calm and increased concentration, confidence and relaxation. Other foods that boost serotonin levels include fresh vegetables, especially root crops, squash and fresh fruits. Apples are noted for bringing oxygen to the brain and being rich in complex carbohydrates and B vitamins, critical nutrients for balanced serotonin levels. Serotonin-boosting snacks include popcorn, tortilla & corn chips, and natural sweeteners like maple syrup, honey and rice syrup. Chocolate beans contain PEA, called the molecule of love. Chocolate stimulates the central nervous system and acts like a natural antidepressant. Herbs that help boost serotonin levels include oatstraw, which is loaded with B vitamins, and the roots of angelica, burdock, dandelion, ginseng, wild yam and black cohosh. Cannabis, long called the “giver of joy”, significantly raises serotonin levels. Activities that enhance serotonin levels include gentle yoga or tai chi, walking, stretching, being in nature, sunshine, clear skies, mild wind, prayer and meditation. Rain and dark wintry weather cause a decline in serotonin levels. Talking with a compassionate person or writing to oneself in a journal is very healing and boosts immunity as well as serotonin levels. Among the acknowledged side effects of pharmaceutical antidepressant drugs such as Prozac and the SSRI medications, and clearly listed in the marketing literature, is dehumanization and depersonalization. Prozac interferes with the neurotransmitter action that connects the frontal lobes of the brain with the rest of the brain, thus creating a chemical lobotomy effect. The frontal lobe is the seat of higher human functions such as love, connection, empathy, creativity, initiative, autonomy and willpower. By reducing human self-consciousness these drugs may rob us of our spirituality, our very souls. Oatstraw is restorative, the essence of nourishment for the brain and nervous system. Very grounding. Essential for those who lack concentration skills whether adult or child. Roses and rose hips nourish the brain and nervous system, are calming, stress relieving and centering. Roses nourish our ability to give and accept love. Used to alleviate pains of the emotional heart, to lift spirits and enhance vitality. Rose hips are vital for children who have been diagnosed with Attention Deficit Disorder. Lavender is antidepressant, tranquilizing and stress relieving. Skullcap is nature’s finest nervine, a superb nourisher of the brain and nervous system; pain relieving, antidepressant and sedating. Helps focus and concentration. Red clover nourishes the entire body, provides plenty of protein, B vitamins, and calcium, all essential brain nourishing nutrients. Chamomile is mildly sedating, soothing and especially good for children. Sage inhibits the breakdown of acetylcholine thus protects against Alzheimer’s. Highly regarded as a brain tonic down through the ages. Rosemary is a nervine, stress reliever and antidepressant. It increases alertness, strengthens memory and acts as an all-around brain tonic. Garlic stimulates the brain and has a positive effect on brain functioning, increasing alertness and energy. Ginkgo brings blood to the brain, improves mood and sociability, sharpens concentration and intellect, and eases tension and anxiety. Ginseng is rejuvenating, restorative, boosts energy and vitality and is tonic to the brain. Antidepressant, adaptogenic, an excellent ally for anyone under physical, emotional, mental or spiritual stress. Promotes strong nerves, sound sleep, improves memory, clear thinking and enhances concentration. Angelica is revitalizing, restorative and offers rich stores of B vitamins, including B12, calcium, magnesium and iron, all necessary nutrients for healthy brain and nervous system functioning. Lemon Balm is an effective natural tranquilizer and antidepressant. It is anesthetic, pain easing and called a safeguard against senility. Lemon balm nourishes the brain. John’s Wort is effective against mild to moderate depression, alleviates anxiety, insomnia, and irritability and eases pain. Motherwort supports us emotionally. Motherwort offers emotional stability while she teaches us what is necessary for strong emotional health. Our sharp prickly parts need to be acknowledged and accepted as well as our soft fuzzy parts. Motherwort displays both proudly.Motherwort is otherwise known as Mugwort, also otherwise known as my favorite herb. It's in several of season teas, and as a tincture, for more concentrated and portable consumption. B Vitamins - cooperate as a team to insure good health and a well functioning brain and nervous system. The entire B complex, thiamine, riboflavin, niacin, B6, B12, folic acid, choline, inositol, biotin, PABA & pantothenate, are critical for healthy brain functioning. A deficiency of these nutrients is implicated in many mental dysfunctions, including schizophrenia. An abundance of B vitamins lifts depression and relieves stress and anxiety. B vitamins can be found in whole grains, liver, milk products, lean meats, vegetables, fruit and herbs. Herbal sources of B complex vitamins include angelica, peppermint, burdock, sage, yellow dock, red clover, fenugreek, raspberry leaves, nettles, yarrow, roses and rose hips, bee pollen, hops, raspberry leaves, red clover, slippery elm, Echinacea, licorice, rose/rose hips, nettles.